As the pastry chef of Gabriel Kreuther and Kreuther Handcrafted Chocolate, Marc Aumont creates modern, seasonal desserts rooted in classical French technique that celebrate New York. Born in Tours, France, Aumont spent his childhood in Chamonix-Mount Blanc surrounded by the world of pastry at his parent’s bakery, La Gerbe d’Or. From a young age, he spent many hours in the shop with his father, learning classic French pastry techniques and flavor combinations, while developing a deep fascination for the delicate art of chocolate and sugar sculpture. 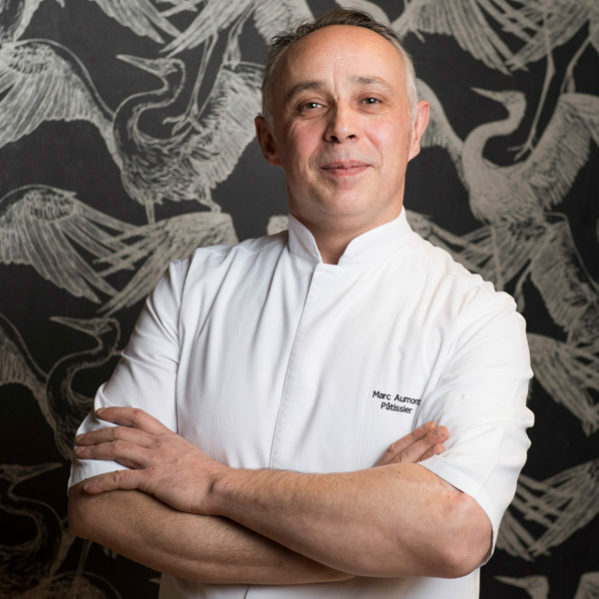 After 12 years with the family business, Aumont enrolled in the Culinary School of Pastry in Groisy, France for his professional pastry chef degree. After graduation, he moved on to the Ecole Nationale Superieure de la Patisserie in Yssingeaux, France, where he spent six years focusing on confectionary, ice cream and chocolate studies. Aumont relocated to New York City in 2000 to work with chef David Bouley at Bouley Bakery. There, he developed traditional French recipes with a modern flair, before moving into a restaurant setting at Compass restaurant, where he was praised for his artful desserts by New York magazine, New York Observer and The New York Daily News. At Gabriel Kreuther, Aumont continues his collaboration with chef Kreuther, and brings his singular touch to the dessert menu, calling upon his experience, travels and dedication to seasonality to create beautiful and delicious desserts with universal appeal. In November 2016, Aumont teamed up again with chef Kreuther to open Kreuther Handcrafted Chocolate right next door to the restaurant. The chocolate shop has been awarded Gold and Silver at the International Chocolate Awards 2018 and was named to Eater’s guide to Essential American Chocolate Shops. At the chocolate shop guests can select from a dynamic menu of freshly made chocolates inspired by everything from the changing seasons of New York City to classic American flavor combinations.